Paris is the city of romance, the city for lovers, for dreamers and for anyone who loves a buttery croissant. With so much to see and do, how do you plan your trip to ensure you can see as much as possible, in the time you have available to spend in this luxurious city? Thankfully, Paris is a very walkable city, and you can see most of the sights by foot in about four days, or spread it out over longer to spend more lazy afternoons sitting in beautiful cafes, watching the world go by around you while drinking delicious Cafe-au-lait and munching on to-die-for pastries. The Eiffel Tower, Notre Dame Cathedral and a Seine River Cruise. Yes, it’s a cliche, everyone goes to Paris to see the Eiffel Tower, but you just have to. This piece of history is an engineering marvel. It took two years to construct and opened just before the 1889 World’s Fair in Paris that celebrated the Centennial of the French Revolution. Construction of the tower proved difficult, due to not only the shear size of it, but also due in part to the soil it rests on, but, non-the-less, they persisted and the tower opened just before the fair, and has wowed the world ever since. You can view the tower from the base, and take some great photos on the grounds surrounding it, but, for those who are feeling more adventurous, take a tour to the top. You have the choice of three levels to climb and enjoy. During a renovation, a glass floor was added to the first level, to give visitors a view of the crowd below. The higher you climb, the better the view of the city you’re going to get. You need to make room in your itinerary to visit the tower during the day, and again after sunset. You can do these both in the same day by visiting, staying for a meal in one of the restaurants and then getting a beautiful view of the tower again once the sun has gone down, and it’s illuminated for the evening crowds. Once you have seen the Eiffel Tower, it’s time to see the Notre-Dame Cathedral. Whether you are religious or not, this ornate cathedral is must see as there is nothing else like it in the world. It features two spires, and beautiful stained-glass windows. After walking for the day, it’s time to take a romantic ride down the Seine River at sunset. There are several types of tours to choose from, including narrated history tours of the river and the architecture surrounding it, or, you can aim for a dinner cruise followed by a cabaret show. Depending on your budget, and your other plans for the day, the cruises run at several times. An earlier dinner cruise will be less expensive than the later, champagne cruise, and both are great options. Put your feet up, and relax, after all, you’ve got a busy few days ahead of you. Champs-Élysées, L’Arc De Triomphe, Rue Cler and Place de la Concorde. When visiting Paris, you must take a bit of time to stroll down the Champs-Élysées to window shop. The street is lined with beautiful cafes, theatres and luxurious stores and at its head is the Arc de Triomphe. This 1.91km long street boasts beautiful parks and gardens that if you have the time, you should take a stroll through and take in some of the history. During the holiday seasons, the street is adorned with lights and decorations for visitors to enjoy. After visiting the Champs-Élysées you can take a stroll to the end and see the Arc de Triomphe. The L’Arc de Triomphe is one of the most well-known monuments in Paris, sitting at the end of the Champs D’Elysee at the centre of the Place Charles de Gaulle. Commissioned in 1806, the took many years for the monument to be constructed and it was finally finished in 1836. The Arc was a major part of history during World War I where it became a rallying point for French troops. In 1995, the Arc became the scene of a terrorist bombing. Today, the Arc de Triomphe stands a monument to history, and no visit to Paris is complete without taking the trip to see it and pay respect to the tomb of the unknown soldier. Pedestrians are encouraged to use one of the two underpasses under the round-a-bout to access it due the volume of traffic in the area. You can then visit the top of the Arc to get an amazing view of the city of Paris. Now that you might have worked up an appetite, it’s time to visit the Rue Cler. This famous street is known for it’s pastries and French delicacies and is a must-visit on any trip. The Rue Cler also features several museums and shops, so don’t rush off and spend some time here strolling and peeking in windows while looking for the perfect French souvenir from your travels. It’s time to walk-off those pastries and see the Place de La Concorde. Steeped in rich history as it happens to be the location where Marie Antoinette (and others) faced the guillotine. Sit next the fountain, or take some photos with the other tourists, for a reminder that you once stepped back in history. These days, the Place is more relaxing with it’s beautiful architecture and pretty fountains. Les Invalides, Basilique du Sacré-Cœur, Place du Tertre, Hop on, Hop Off and Moulin Rouge. Day 3 is a treat with more history to see. The first stop is to Les Invalides, where Napoleon’s tomb is located. Les Invalides was originally built to house injured and unwell soldiers, and in later times was used as an institution for veterans. Prepare to spend a few hours here looking into the museums and reading about the French military history. The Basilique du Sacré-Cœur is beautiful, white, Roman Catholic church sits on top of a hill with a spectacular view of the city. Pay the entrance fee and climb the stairs and sit at the top to enjoy all there is to see. What out for pick-pockets here as this is a common occurrence. Construction began in 1875 and the was finished in 1914. Today, the Basilica is said to honour those who have lost their lives during time of war. Once you have seen the Basilique, it’s time to see something a bit more down to earth and fun. The Place du Tetre is home to artisans, artists and musicians and is a relaxed and fun place to do some shopping. This market is a fantastic place to buy some nice souvenirs from your trip and take in some of the local culture. If your feet are tired, consider spending the remaining day on a hop on, hop off bus tour. Rest your tired legs while being chauffeured from the top of a double-decker bus where you can grab some spectacular photographs. You’ll be able to jump off the bus at any stop on the tour and take a closer look at the sights, and then hop back on and resume the ride to the next destination. This is a fun way to see a lot of sights in just a few hours, so you can really say you saw it all. After a long day of touring, you might want to take in a show at the Moulin Rouge (hopefully you have purchased your tickets in advance). This history cabaret show is the birthplace of the Can Can. Make sure you dress nicely as this is an upscale establishment. Dinner here is on the expensive side, but is definitely worth it in the end. The Louvre, Jardin de Tuileries, Palace of Versailles and Chez André. Day four is going to be for museums, and you might as well start with The Louvre museum. The museum opened in 1793 and is currently the most-visited museum in the world. It is one of the largest art-museums in the world. It’s iconic glass pyramid was opened in 1989 as part of a major renovation. The museum features art from every century, all over the world. From Egyptian antiquities, to Roman sculptures and even the Mona Lisa, there is something for every taste. Underneath the museum there is a small shopping mall, which includes places for a quick bite to eat, as well as some quick shopping. Don’t forget to snap a photo of the museum at night to remember how beautiful that pyramid looks all lit up under the evening sky. Once you have visited the museum, grab a bite to eat and bring it next door to the Jardin de Tuileries for a picnic. This park became a public garden after the French Revolution, and is now a place where Parisians stroll, meet up and relax together. You can’t go home without seeing the Palace of Versailles. The palace became the principal royal residence in 1682 under Louis XIV and is situated about 20 km outside of Paris. As the king spent more and more time at the palace, it was made larger and larger to suit his needs. The ‘Hall of Mirrors’ was made famous after it’s design and features 17 arches, clad in mirrors. When Marie Antoinette moved in, she made a series of changes to the palace to incorporate her style. It was during this period, that the French Revolution took place, and the monarchy was abolished. All paintings and sculptures were transferred to the Louvre and the furniture and finishes sold at auction. Napoleon used the palace to throw several elaborate balls and parties as well as to host royals from around the world. During the 20th century, a large-scale restoration began at the palace in order to restore it’s original beauty and architecture. The restoration was interrupted when World War I broke out, and then again during World War II. The Treaty of Versaille, that signaled the end of WWI was actually signed in the Hall of Mirrors, making this a notable place in history. In 1978, the palace suffered damage during a terrorist bombing, but has since been restored. The palace has been designated a World Heritage Site, so take a few hours to explore the architecture and visit the grounds, the gardens, the outbuildings and the fountains before heading back into the city for your last meal before heading home. Your last night in Paris should be steeped in romance and fine, French food. After all, no Paris vacation is complete without at least one amazing dinner. Paris is full of fantastic restaurants such as Chez Andre, Le Procope and la Coupole, all of which can offer you five-star dining and wine pairings. Don’t forget to call ahead and make a reservation to ensure a seating. There you have it, a complete itinerary for a full four days in Paris, France. Spread this out over a longer period to feel less rushed (and spend more time in the wonderful cafes, people watching) if you are able to. You’ll see everything that makes Paris, Paris, while not missing any of the must-sees. 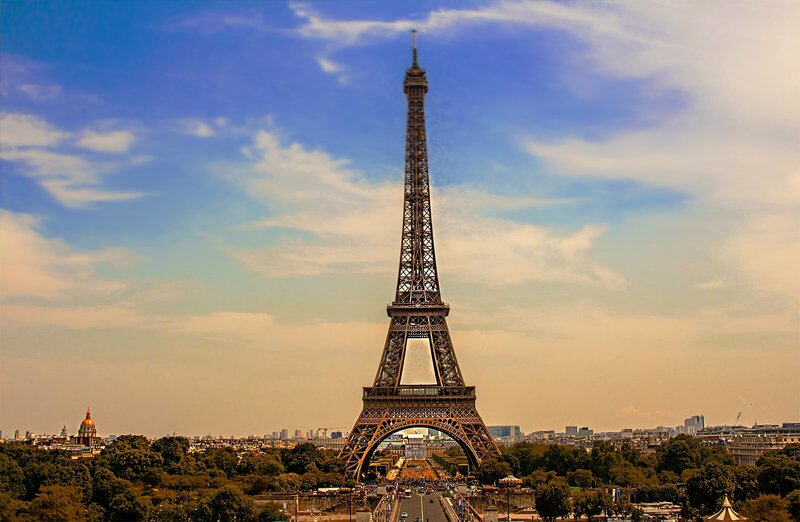 From the famous architecture of the Palace of Versaille and the Arc de Triomphe to the tourist hot spots of the Louvre and the Eiffel Tower, you’ll be hitting everything on your wish list. Depending on the weather and time of year, you may need to make a few arrangements to your itinerary, but that is the nice part of being flexible on your trip. Make sure to treat yourself to some amazing pastries, coffees and wines while out and about to get a full-Paris experience, after all, part of the reason for visiting Paris is to eat the amazing food. You’ll be tired after your amazing trip, but it will definitely have been worth it.